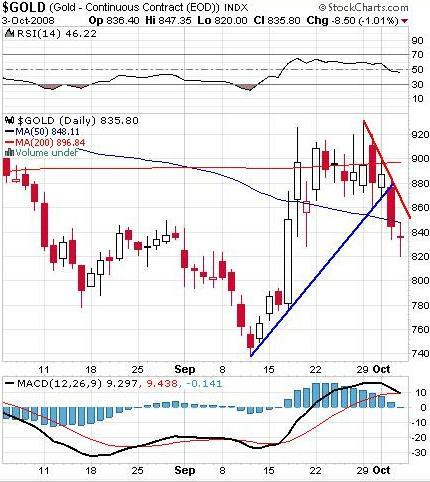 October 4, 2008 – More Thoughts on Gold, and the Big Puke? Well, that certainly looked like “The Big Puke”. There can be no doubt that we are in a bear market, as the Dow is now down almost to where it was 3 years ago, and falling fast. Unfortunately, I can’t find anyone who said, a month ago, that the worst was yet to come, and we should all be loading up on puts and shorts of whatever we could sell short. Including me. chart on RIMM looks scary to me. I see 50 as an easy possibility. I would hedge that long position with some Jan 40 PUTS. In fact I might pick some of those up on Monday if RIMM bounces. In this market… I think it’s a little crazy to play against bad news on a stock. Well, it turned out that jjj000 was correct; RIMM was scary, it was the wrong move, so I dumped it on Friday at a small loss. Puts would have been a better idea. 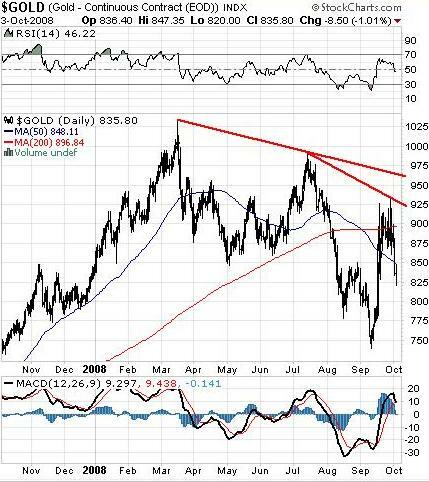 The two year gold chart you showed remains in down trend. Maybe it is brave to go against right now, but it might also be very foolish. From the base around $740 in the second week of September, in five trading days gold peaked at over $920, for a gain of 24% in a week, with over $100 of that gain happening in one day. 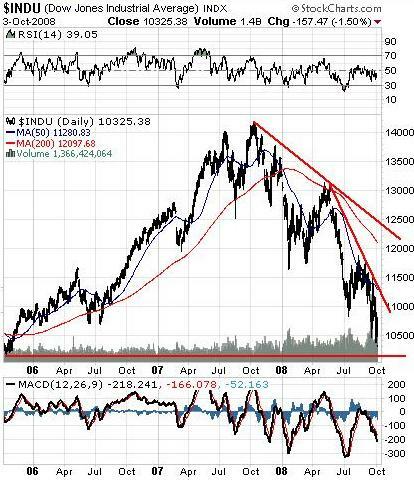 That uptrend ended yesterday when the blue uptrend line was broken, so for now the red down trend line rules the roost. Again, the chart looks bad. The peak of over $1,000 in March was followed by a peak of under $1,000 in July, followed by the recent peak of just over $920 earlier in September. It doesn’t take a mathematician to understand that a series of lower highs is a down trend. 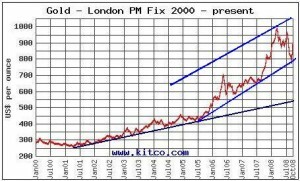 The fact that gold is now below both it’s 50 day and 200 day moving average shows we are going in the wrong direction. 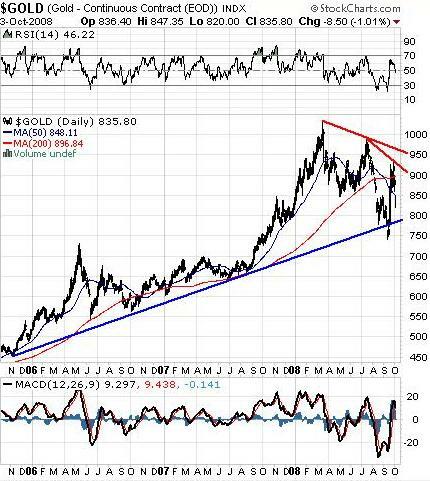 Factoring out the massive drop and bounce in early September, the argument can be made that the long term uptrend remains in place, and we are still in an obvious, long term, bull market for gold. 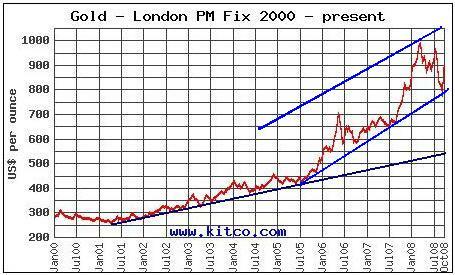 For a better perspective, here’s an 8 year gold chart, showing that we are in an obvious uptrend. The point, dear reader, is that it’s been rocky of late, but that long term we are moving in the right direction: up. My views on gold are well documented, and I believe they are shared by most of you. In short, the U.S. and other governments continue to create money to “bailout” the economy, and each extra dollar they create reduces the value of the remaining dollars. So far, here’s the scorecard: Fannie Mae and Freddie Mac were nationalized, Merrill Lynch and Washington Mutual were bought out, ,Bear Stearns and AIG are gone, and Lehman Brothers is bankrupt and has collapsed. The U.S. government will spend a trillion dollars or whatever it takes to soak up the mess. The result of all of this spending will be, as with all paper currencies since the dawn of time, the dollar will eventually reach it’s true value, which is zero. The only class of assets that can’t be created out of thin air, and are not therefore someone else’s liability, are physical metals, like gold and silver. So, this week, and started investigating the purchase of physical gold. (To save you having to read all of my notes on this, I’ve created a separate page on physical gold and silver that you can read at your leisure, and comment on as you see fit). 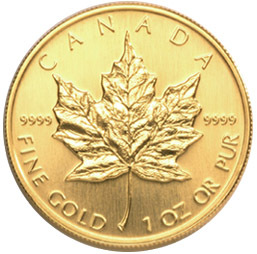 I decided that, since I own no physical gold or silver, I would like to start by buying some coins, and since I’m Canadian, I thought a gold maple leaf would be a good place to start. In order to reflect current market conditions for Silver Maple Leaf and US Silver Eagle coins, Kitco is temporarily increasing its bid (buyback) prices for these particular products. Our current bid for these items is now $1.35 USD above the silver spot bid quote found. In other words, the spot price means nothing; we will pay you more than the spot price. How is it possible that the spot price of gold is falling, and yet their is no physical supply? Doesn’t basic economics tell us that if supply is short, prices go up? How can it be that, if no gold is available, the price of gold isn’t $1,500 per ounce or more? The answer, it would seem, is gold and silver price manipulation. The theory here is that the government knows that precious metals are the only real measure of value, and if they let the price of gold rise to it’s true level, it would be obvious to everyone that paper money is worthless. So, the government does what it can to suppress the price of gold and silver. They sell their own bullion, and they encourage bullion banks to do the same. They encourage short selling of the metal to drive the price down. (Interesting, isn’t it, that they ban the short selling of financial stocks, but encourage the short selling of gold). You can do your own research on this one. Start with the Gold Anti-Trust Action Committee, then read more on silver market manipulation and read Ted Butler’s comments. I have no proof that the market is being manipulated, but I can’t think of any other explanation to explain why the spot price is down, but there is no physical supply. First, we are not out of the woods yet. The sell off after the bailout bill was passed proves that. So, for downside protection, I bought some RSW – Rydex Inverse 2X S&P ETF. This ETF is designed to go up by twice as much as the drop in the S&P. I bought it early Friday afternoon, and it sharply increased after that, so I’m actually in the money on that one. I assume that once earnings season starts, followed by tax loss selling season, the market will continue to fall, so I want to be protected. RSW is now 7% of my portfolio, and I will probably increase my holdings on up days. Second, I’m raising cash by selling anything that isn’t a solid blue chip company (whatever that means), or a junior with a potentially explosive upside. I am currently one third in cash, and that’s probably about right. On the big down days, I can deploy the cash, or just sit on it. Third, I will continue to hold the solid gold stocks, like ABX.TO – Barrick Gold Corp., AEM.TO – Agnico-Eagle Mines Ltd., K.TO – Kinross Gold Corp. and G.TO – Goldcorp Inc. Those four stocks are now 25% of my portfolio. Fourth, I will hold some juniors, but only those with strong upside, due to special situations or upcoming drilling results. Finally, I will keep my eye open for special situations, like SMD.V – Strategic Metals Ltd., a stock that I have owned in the past, and started buying again this week (you can read my full comments on my Strategic Metals Ltd. post). It’s been an eventful week, and probably will be again next week, so thanks for reading, and please continue to on the Forum.